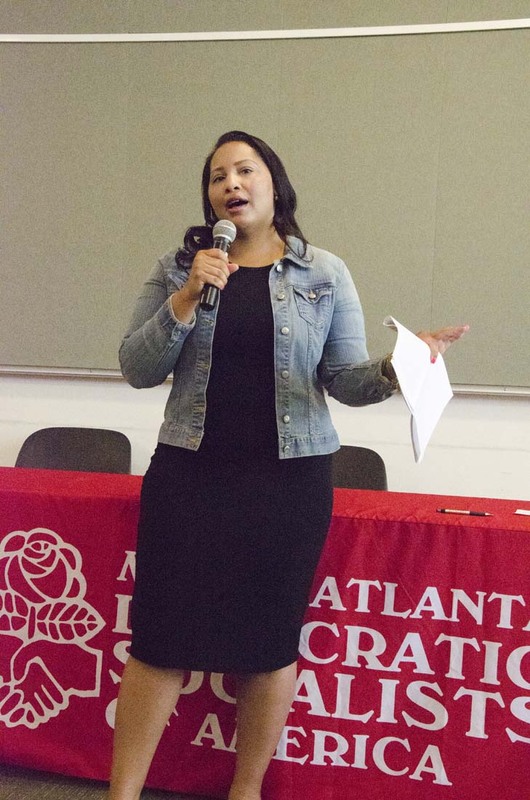 At our general membership meeting April 1, progressive State Rep. Renitta Shannon (renitta.shannon@house.ga.gov) provided a no-fooling rundown of the mostly toxic bills passed by the Ga. General Assembly and currently on Gov. Deal’s desk for him to sign into law – or not – within 40 days from March 30. Her clear presentation of the bizarre ways some bills were pushed through and their implications was a wake-up call. Here is a superficial summary of just one example: HB452 (look it up). At the last minute, language from two failed bills was added to HB452 to 1) make many forms of protest while committing a felony “domestic terrorism” and 2) set up a public registry of formerly incarcerated undocumented immigrants who have served their time and still live in Georgia, potentially setting them up as targets for hate crimes. We also heard reports on current MADSA and allied activities, including our Education and Social Media working groups, the Jacobin reading group, the IBM workers’ petition campaign (see story below), and Atlanta Jobs With Justice’s May Day/International Workers’ Day celebration and action (look for more on May Day soon, plans are evolving). Finally, we formed an important committee to plan the 2017 Douglass-Debs Dinner, our major fundraiser, so that Chair Milt Tambor (in photo at left) can be relieved of his 10-year duties as the lead organizer of this very popular community event. To volunteer contact mltambor@gmail.com. Following the meeting, many of us fought traffic to get downtown just in time to join the Turner Field Community Benefits Coalition and the Housing Justice League as they rallied and marched to Turner Field demanding that Ga. State U. sign a community benefits agreement so that residents of adjacent inner city neighborhoods will be assured of “development without displacement.” Many marchers set up tents to camp out overnight in front of Turner Field.